If you were thinking about getting a membership to the Montgomery Zoo, now is the time! Because effective March 31, 2012 the rates are increasing quite a bit. A family membership (zoo only) is currently $50 but will be going up to $85! Every membership option is going up. I have mentioned before why I think a membership to the zoo is a great deal, but let's look at this again. We get the combo membership that includes the Mann Museum and on hot or rainy days we still have something to do that is inside. The combo membership is currently $80 for a family (two adults and up to 6 dependent children) but is going up to $115 (not including the train rides). 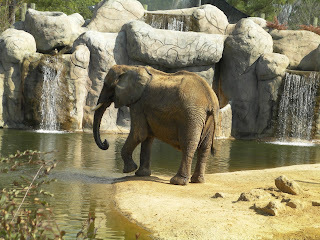 I am looking forward to all of the new things going on at the zoo. The construction for the Sky Lift is really going and just this week a new exhibit is opening- Parakeet Cove. Zoo members also get free admission to Zoo Weekend, Holiday Light Festival and other zoo events all year long. If you travel, there are other zoos all over the country that give you free or reduced admission with your Montgomery Zoo membership. The info that I have doesn't say if the regular admission rates will be going up (but I suspect they could.) If that happens, it makes getting a membership now an even better deal.